Using NASA Media Assets - For Free! Composite Image of Ed White's First Spacewalk (1965) and a Deep Space Nebula. Elements of this image are furnished by NASA. 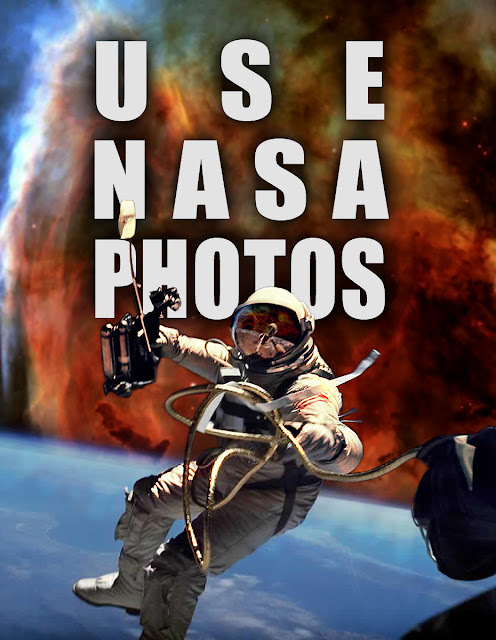 Did you know you can use many of the images NASA has captured over the years - totally free under a royalty free license? I bet you didn't. This article has a few quick links for you to do your own research if you don't believe me, some tips on usage, and some ideas to help inspire you with a way to use them! For something as inaccessible to everyman as outer space is, it's pretty cool that we can have pretty much free reign on the use of the images at least. I've been aware of this for a while, but never bothered to look too deeply into it. -- until recently. I stumbled upon an artist's micro stock photo portfolio that was essentially composed of all manner of composite images made from NASA elements. Not only did these photos look awesome - hollywood blockbuster style lighting and stuff - but this artist is selling them - and it's not illegal. - and the Royalty Free license doesn't apply to the likeness of any faces appearing in the images (so the license doesn't include a model release ). 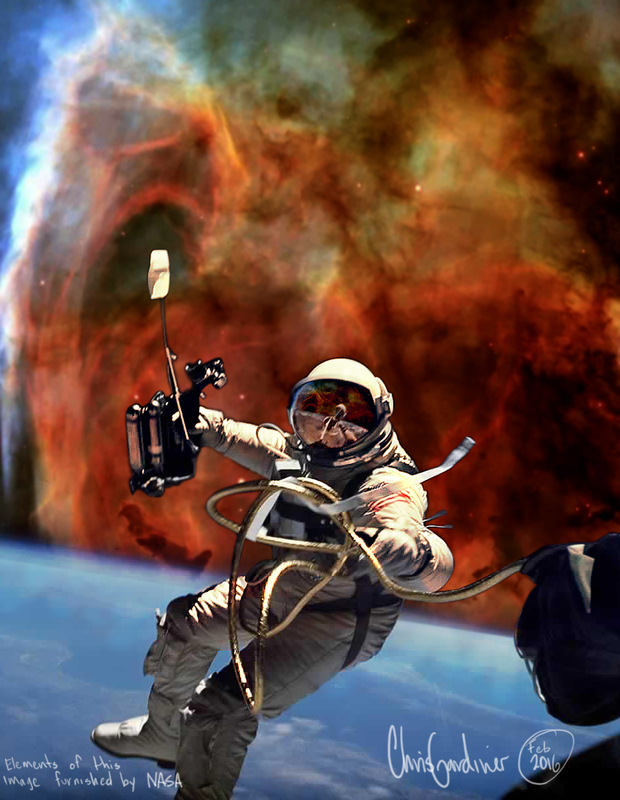 Today, I quickly browsed a handful and pulled two into photoshop - one of Ed White on the first space walk ever in 1965, and one of some Nebula, presumably from the Hubble Space Telescope. I forgot to check the name to be honest. And from those two pieces and about 20 minutes in photoshop came what you see above as the header image, and below in the version without text. I chose these two because a) I knew I wanted to put a nebula or some deep space object behind something else. b) Ed White's spacewalk was too easy to use. The entire background was a plain black already so my isolation of the astronaut and planet earth wasn't very time consuming. and Voila! It doesn't take a genius to realize that this is a wealth of potential for just about anyone with a computer and an idea. So here's some inspiration for you to do something creative with NASAs photos. After all, there's like a couple billion dollars of production value in these, you're not going to let those tax dollars go to waste are you? Thanks America! Make yourself a coffee table art book. Order an extra one to show to people, sell copies! Use the 3D models or video as parts of larger video or animation projects. Use the pen tool to create a selection around the astronaut. To save time, only do the portion of his body that is above the horizon line of earth. Use a softer selection method to mask the earth. Drop the nebula image into background, resize. Apply levels adjustment to match blackpoints and white points when needed. And that's really it. Not as fast as Voila! but… haha. Well there ya go! If you end up reading this and discovering this opportunity for the first time, and actually making something of it - please show me - I'd be really happy to see it!